Ex-Abortion Clinic Director Now Pro-Life Activist to Speak at Georgetown U. Same Day as Planned Parenthood Pres. 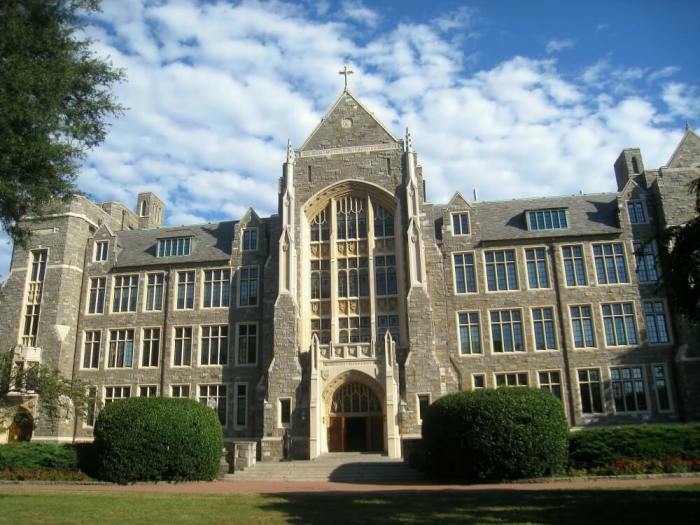 A pro-life student group at Georgetown University has invited a former Planned Parenthood clinic manager turned pro-life activist to speak on campus the very same day that Planned Parenthood CEO Cecile Richards is scheduled to speak at the nation's oldest Catholic school. Although abortion directly conflicts with Catholic teachings, the Georgetown student-run organization The Lecture Fund announced last month that Richards, the head of the United States' largest abortion business, is going to speak at the Washington D.C. campus next week. Following the announcement of Richards' April 20 visit, the student group Georgetown Right to Life felt the need to balance the political conversation on campus. On Tuesday, the affiliate group of the Students for Life of America announced that former Planned Parenthood "employee of the year" and abortion clinic director Abby Johnson will also be speaking on campus next Wednesday to explain how Planned Parenthood is profiting off the exploitation of women. "I think it is abhorrent that a Catholic university would ask the head of the largest abortion corporation in the country to give a speech on their campus. We have to address it," Johnson told The Christian Post on Wednesday. "Those of us who are Catholic, and I am Catholic, we have to address it and we have to meet this type of activity with a certain amount of resistance." Johnson, author of the 2014 book Unplanned: The Dramatic True Story of a Former Planned Parenthood Leader's Eye-Opening Journey across the Life Line, left Planned Parenthood in 2009 after witnessing a live ultrasound-guided abortion procedure, in which she saw a baby fighting and struggling for its life. When Johnson left Planned Parenthood, the abortion giant took her to court and unsuccessfully tried to get a permanent gag order placed on her so that she could not talk about what she saw in abortion clinics. "My thoughts are going to focus on [Planned Parenthood] and what their bottom line is and how they are exploiting women and manipulating them for profit," Johnson stated. "I have worked for Planned Parenthood for years. I know their talking points better than anybody else and because of that, I know how to effectively deconstruct their talking points. That is essentially what I plan to do." As a convert to the pro-life movement, Johnson has spoken at at least 50 college campuses in the last six years to combat the pro-abortion advocacy that takes place on so many of America's college campuses. "I tell people that wherever vulnerable women are, so is Planned Parenthood. Their intention is to be on every college campus, whether it is a Catholic university, private or public, that is their target demographic for their abortion quota, the abortion quota that they have to meet — women between the ages of 18 and 29," Johnson asserted. "The fact that college campuses are allowing it, knowing what we know about Planned Parenthood and seeing the things that we have seen about them — the corruption, the manipulation — the fact that they are still allowed to be on college campuses, particularly Christian and Catholic campuses, is completely unacceptable and something that we have to fight against." While Planned Parenthood supporters maintain that Planned Parenthood clinics provide other health services for women and that those who oppose Planned Parenthood are opposed to "healthcare" for women, Johnson told CP that Planned Parenthood only offers other services like contraception and testing for sexually transmitted diseases because the organization knows that the other services will help lead to more abortion customers. "Every service that Planned Parenthood provides leads back to abortion and that is why they provide it. It's not to be charitable. It's not because they care about women. It's because they have a product to sell and selling abortion is part of their business model," Johnson argued. "The reason they provide widespread contraception for women is for one reason, because they know that 54 percent of women who have an abortion were contracepting at the time they got pregnant. They know that eventually contraception is going to fail and when it does fail and they are faced with and unplanned pregnancy, they will most likely return to the place they got the contraception." "Why do they provide all these STD services? Because they genuinely care?" Johnson asked. "No, its because they know that by providing STD services they are able to engage with a population of people that are probably participating in high-risk sexual behavior and we know that people who participate in high-risk sexual behavior are more likely to have an unplanned pregnancy. Because they have already had the first point of contact with Planned Parenthood, they are more likely to go back to Planned Parenthood if they have an unplanned pregnancy." Johnson further explained that Planned Parenthood sets abortion quotas for clinics. To provide incentive for their employees to reach their quotas, Johnson claims that Planned Parenthood not only offers bonuses for directors who meet their quotas but also fires employees who don't meet their quotas. "In our facilities, we lost 5 percent of our workforce because overall, our facilities were not meeting that quota," she said. "That was after probably about two to three months, they started cutting people, so we lost 5 percent." Johnson has also started an organization called Then There Were None, which aims to inspire abortion clinic workers to leave the industry. Johnson said that in the last three years, the organization has inspired over 217 abortion clinic workers, including six full-time abortionists to leave the abortion industry.